Packing those lunches day in and day out has got to be a serious chore at times. 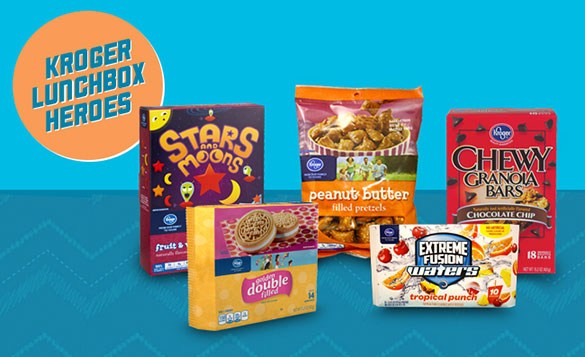 Kroger offers some fantastic 'go to' snacks that are here to save the day! Though I don't have to daily pack lunches with my children being homeschooled, we do go on field trips and have events where I need to pack lunches. 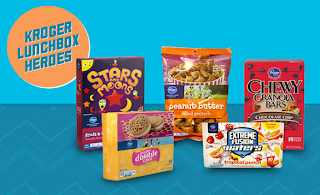 Kroger snacks have been fantastic for making it easy to pack things the kids will love and eat! I don't always have time for homemade foods, even with the desire. I so enjoy the quality snacks Kroger offers at fantastic prices! Extreme fusion waters were a hit for the kids and Mom! With no artificial junk in them, and 25% less sugar, that is a huge plus for me. Much tastier for them than just plain water. The Double Filled cookies were outstanding! Definitely rivals the name brand with this product. I loved the double chocolate and probably ate too many of them. I don't have a photo of the Fruit Snacks. As soon as that box was open, they were gone! I loved, loved that they had real fruit and veggies in them. Not just a sugar filled snack, but actually something nutritious. Can't beat that. We will definitely be stocking up on those.